Alison is an artist and one of the residents of Ashfield when Jane Lane visits Ashfield in Is It Fall Yet? She is a tall young woman with long, black hair, and striking good looks. 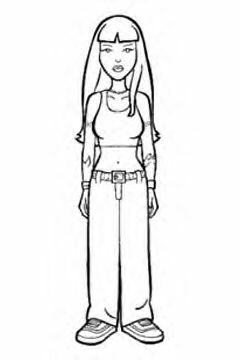 She keeps her midriff bare, wears tattoos, and dresses in hip clothing. Alison and Jane meet while listening to a lecture by visiting artist Daniel Dotson. Neither think much of Dotson's artistic talent, and the two form a common bond. Jane is glad to form a bond with Alison as she has little in common with the other Ashfield artists. Alison is trying to make it as her own as an artist. She works in pastels. When Jane later gets a chance to look at Alison's work, she likes it, but Alison tells Jane that the galleries don't agree and that she wishes that she had had Jane's drive and focus when she was younger. A bet is made where Alison bets that the artists at Ashfield will warm up to Jane if they get a chance to know her. When Alison loses the bet, Jane and Alison have dinner together, and when Jane returns to Alison's cabin, Alison makes a pass at Jane. Not only does Alison state that she's a bisexual, she states that she doesn't believe that Jane is straight, and that the source of Jane's immediate discomfort is that Jane is nervous about making love to a girl. She further states, "I never hit on straight chicks", implying that not only is she sure about her sexuality, but about Jane's as well. After Jane turns down Alison, Alison later tells Jane that she wishes to remain friends with Jane and that she might have made a mistake about Jane's sexuality. However, Jane learns that Alison is "seeing" Daniel Dotson and Alison states "he's not so bad once you get to know him". Jane answers that Dotson couldn't possibly care about Alison, and Alison retorts that she just wants to have fun and belittles Jane for being a high school girl who takes things too seriously. The possible friendship ends when Jane accuses Alison of sleeping with Dotson so that Dotson can introduce her to gallery owners, who might further Alison's career. Jane concludes that Alison lied to her about "giving off gay vibes" and that Alison lied to make Jane believe she was bisexual or gay for the purpose of getting her in bed. Although never stated, it is implied that Alison made the bet with Jane knowing that Jane and the other artists at Ashfield had little in common. This would not only provide the pretext for a romantic (for Alison) dinner with Jane, but Alison knew that the wine served at the dinner might lower Jane's resistance to suggested physical intimacy. "It Takes Two to Tangle" rules on the encounter: "A classic case of resistance [by Jane], here more than justified. There's nothing wrong with exploring your sexuality, but before exploring someone else's you should get a permission slip. ";"
Alison was voiced by rock singer Bif Naked. Almost all of Alison's scenes were cut from the Noggin repeat if Is It Fall Yet?. A possible scenario shown during the credits of Is It College Yet? reveals that Alison goes on to settle down with Lindy and start a family. This version of Alison was born on a world that suffered an Outbreak when she was only a child. Having been exposed to massive amounts of radiation she and many others in her generation developed metahuman abilities. This allowed them to combat the threat until the rise of MetaZacks, Zombies with superhuman abilities and near intact intellect. Ringbearers arrived and swiftly joined the fight. Her father was granted a First Ring by an injured Ringbearer. When he was mortally wounded, he passed the Ring to his daughter. She faced many questions and doubts about her worthiness to wear a Ring let alone a First Ring. One Ringbearer known only as "The Marine" stood up for her and then became her mentor. He was the reason she traveled to Trent Lane’s world. Unable to accept reports of his death, she followed a blast path across dozens of multiverses until finding the right one. During her time with the Corps she has carried on a brief affair with a Master Ringbearer named Mitchell that ended badly. Ring symbol – A spear. She has the metahuman abilities of heightened strength and invulnerability.